Julius and Ethel Rosenberg were a nondescript couple accused in 1950 by the U.S. government of operating a Soviet spy network and giving the Soviet Union plans for the atomic bomb. The trial of the Rosenbergs, which began in March 6, 1951, became a political event of greater importance than any damage they may have done to the United States. It was one of the most controversial trials of the 20th century. Their guilt and the harshness of their sentences continue to be vigorously debated to this day. Screenshot from File No. : 65-58236: Volume No. 1. May 29, 1940 – June 16, 1950. FBI File on Julius and Ethel Rosenberg. Federal Bureau of Investigation Library. Archives Unbound. Web. 21 Mar. 2019. This collection consists of subsections of the greater case file on Julius and Ethel Rosenberg. The file deals specifically with the investigations of Julius and Ethel, with the bulk devoted to Julius. It establishes the Rosenbergs’ relationships with the other key characters in the case: David and Ruth Greenglass, Morton Sobell, and Harry Gold. Also included is a case summary. This is an extremely useful source for scholars of the Cold War, the Red Scare, the McCarthy Era, espionage, political science, and legal studies. Black Americans of all political persuasions were subject to federal scrutiny, harassment, and prosecution. The FBI enlisted black “confidential special informants” to infiltrate a variety of organisations. Hundreds of documents in this collection were originated by such operatives. The collection consists of largely untapped source materials for the major social movements and key figures in early 20th century black history. It includes files on notable figures such as Adam Clayton Powell, Elijah Muhammed, Malcolm X, Paul Robeson, Reverend Jesse Jackson, Thurgood Marshall and W. E. B. Du Bois. As well as files on organisations such as the National Association for the Advancement of Colored People (NAACP), Black Panther Party, Black Nationalist “Hate” Groups, Highlander Folk School and murder investigations such as the Atlanta Child Murders (ATKID), the Ku Klux Klan Murder of Viola Liuzzo, MIBURN (Mississippi Burning) and the murder of Lemuel Penn. 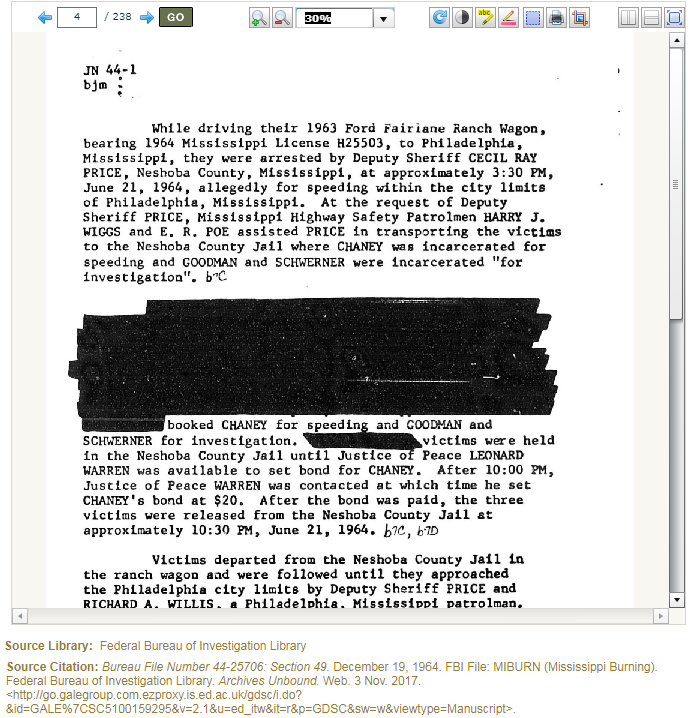 FBI File: Assassination of Martin Luther King; Jr.
Grassroots Civil Rights & Social Activism: FBI Files on Benjamin J. Davis; Jr.
Screenshot from COMPIC 100-138754: Vol. 9. May 12, 1947 – August 3, 1947. J. Edgar Hoover and Radicalism in Hollywood, Part 0001: Communist Infiltration of the Movie Industry. Federal Bureau of Investigation Library. Archives Unbound. Web. 21 Mar. 2019. J. Edgar Hoover (1895-1972), the long standing and controversial Director of the FBI, held an enduring interest in the Hollywood film industry as well as deep distrust of anyone on the political left. 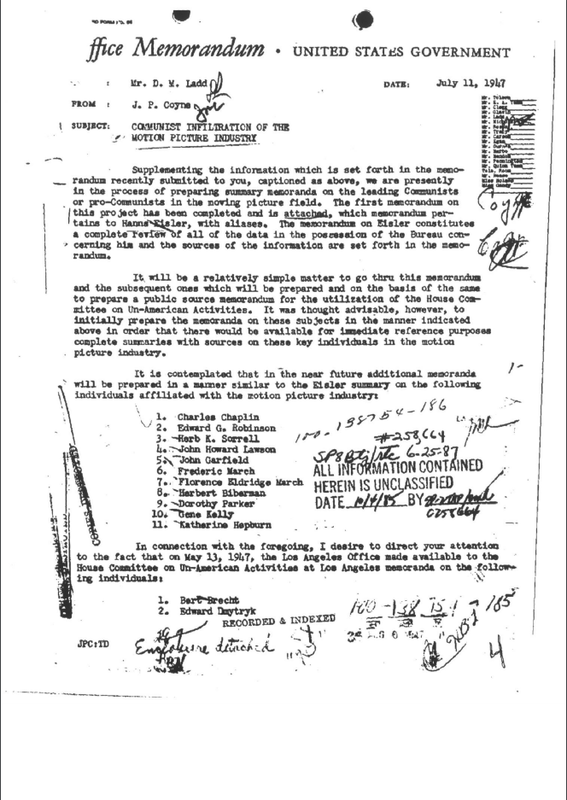 In August 1942 he ordered the bureau’s Los Angeles office to report on “Communist Infiltration of the Motion Picture Industry.” Various FBI reports chronicled the working of major film studios such as MGM, Paramount, RKO, and Warner Brothers, and studio management and labour union power struggles. The FBI’s investigation of Hollywood resulted in many thousands of pages and show a growing operation organised in the early 1940s that continued throughout the Cold War. Screenshot from House Un-American Activities Committee, Jun 8, 1951 – Feb 8, 1952. June 8, 1951 – February 8, 1952. FBI File on the House Committee on Un-American Activities (HUAC). Federal Bureau of Investigation Library. Archives Unbound. Web. 21 Mar. 2019. The FBI and the House Committee on Un-American Activities (later called the House Un-American Activities Committee, or HUAC) developed a working relationship in the period 1938 through 1975 that increased the authority of the committee and gave the bureau power to investigate suspected communists. The archive is divided into three parts. The first part, 1938-1945, documents clashes between HUAC chairman Martin Dies and the administrations of Franklin D. Roosevelt and Harry Truman. 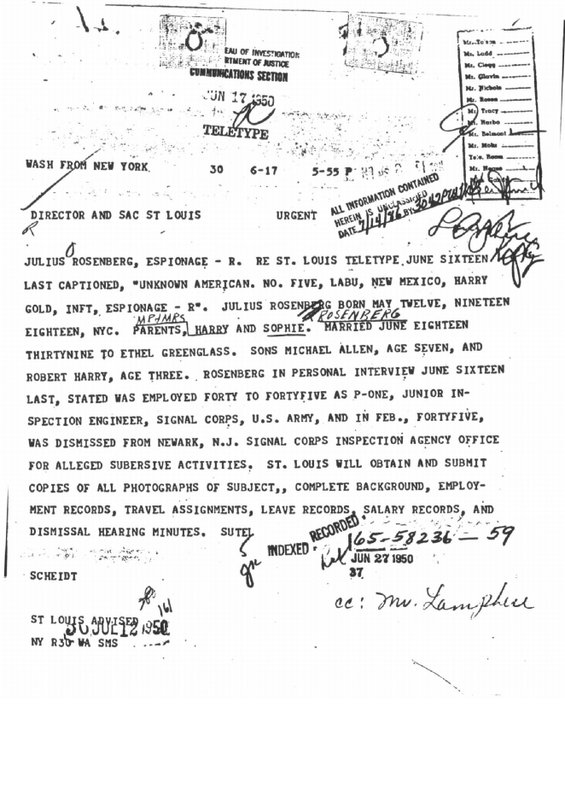 The second section, 1946-1949, records the process by which the FBI and HUAC chose their targets. The final section follows HUAC, renamed the Internal Security Committee, in its attempt to protect the FBI from other congressional investigative committees. The Watergate scandal grew out of the scheme to conceal the connection between the White House and the accused Watergate burglars, who had succeeded in a plan to wiretap telephones at the Democratic National Committee headquarters in the Watergate apartment complex in Washington, D.C. Early in the morning of June 17, 1972, a security guard foiled the break-in to install the bugs. Screenshot from File No. 139-166, Volume 1, Serial 139-4089-2075: #1-75, June 16-22, 1972. June 16, 1972 – June 22, 1972. FBI File on Watergate. Federal Bureau of Investigation Library. Archives Unbound. Web. 21 Mar. 2019. After the election a federal judge refused to accept the claim of those on trial for the break-in that they had acted on their own. In February 1973 the U.S. Senate established the Special Committee on Presidential Campaign Activities to investigate alleged election misdeeds. This archive is a valuable resource for students of the Watergate scandal and modern American political history. Included here are all of the reports and evidence acquired by the FBI, as well as data that was gathered in the campaign activities of the 1972 presidential candidates. This collection highlights the FBI’s efforts to disrupt the activities of the largest of the Puerto Rican independence parties, Partido Independentista Puertorriqueño, and compromise their effectiveness. In addition, these documents provide an insightful documentary history and analysis of why independence was the second-largest political movement in the island, (after support for commonwealth status), and a real alternative. 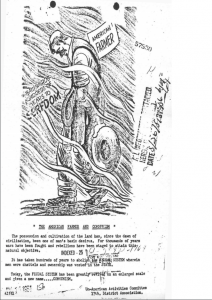 These documents provide invaluable additions to the recorded history of Puerto Rico. 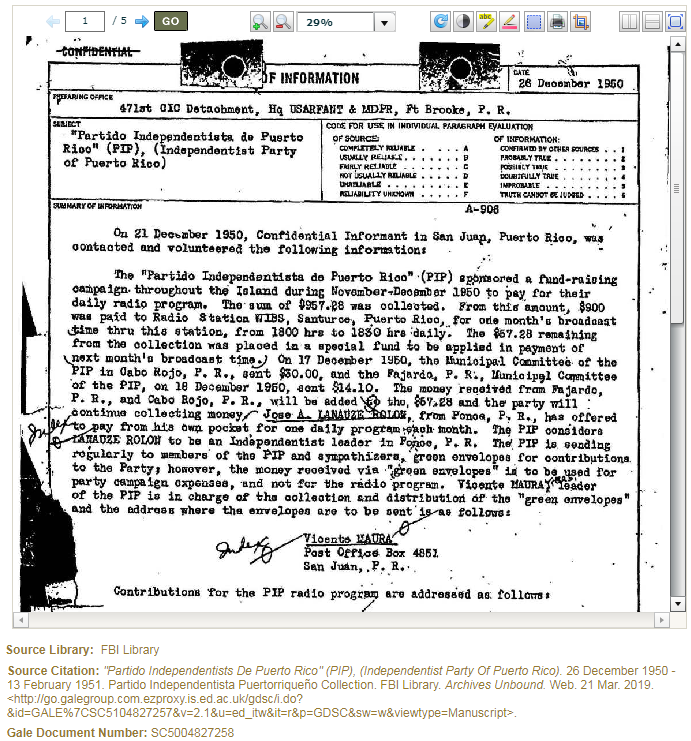 Screenshot from Federal Surveillance of the Partido Independentista Puertorriqueño. 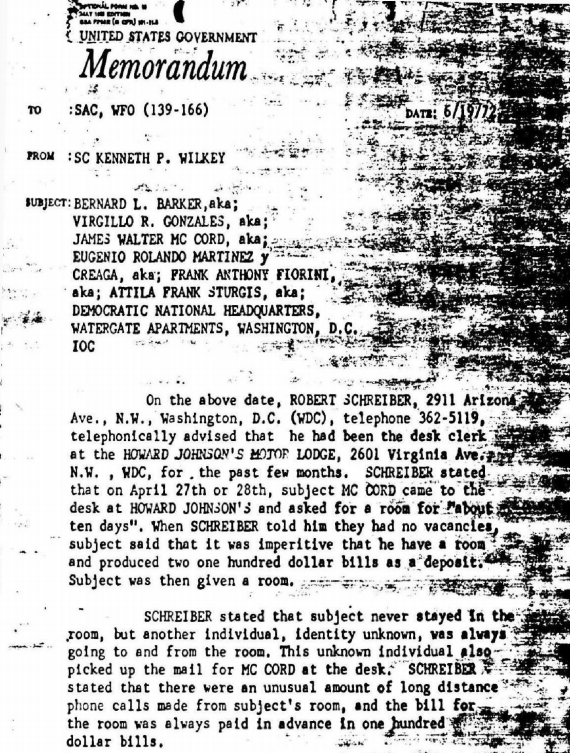 The Mafia in Florida and Cuba: FBI Surveillance of Meyer Lansky and Santo Trafficante; Jr.
You can access all the collections listed above (and more) via Archives Unbound from the Databases A-Z, Primary Source database and DiscoverEd. We hope soon to have direct links to the individual collections from DiscoverEd as well. This entry was posted in Library, Online resource, Primary sources, Spotlight on and tagged 20th century, America, archives, Black history, Cold War, Communism, Databases, History, Hollywood, McCarthy Era, McCarthyism, official documents, Politics, primary source, Radicalism, social history, Spotlight on, surveillance, United States by cstirling. Bookmark the permalink.